Our commentary on the most interesting findings are presented below. I. TIPPING POINT OR PEAK BULL? We might be at the outset of a huge innovation cycle, or we could be late into an aging, over-capitalized market. Opinions point in both directions. The overall sector sentiment is enthusiastic, with increased expectations for new company creation and decreased concerns about funding. With talent predicted as the biggest challenge ahead and funding predicted as the least, we have increased evidence of a frothy market. Or simply extreme bias/hope by overly committed ecosystem participants? 1b What will happen to the capital markets for private	healthcare IT companies? 1c How concerned are you about each of the following challenges to healthcare IT innovation in	the next 12 months? 1d Which of the following 2018 early stage (A & B) financings do you regret not having been in? 1e Which of the following 2018 later stage (Series C on) financings do you regret not having been in? With the repeal and replace debate on the back burner (or at least in the courts) and an industry now adapted to a new administration (until something totally unpredictable gets tweeted next week), people took a calmer, though perhaps more jaded view, of progress in health policy. With tempered concerns over regulatory changes, the industry has very low expectations that the mid-term elections will lead to positive changes for the US healthcare system. 2a How concerned are you about each of the following challenges to healthcare IT innovation in the next 12 months? 2b How will the results of the midterm elections impact the future of the US healthcare system? People are more optimistic that drug prices will be curtailed as a bipartisan effort by congress is underway. Respondents clearly feel that the pharma industry is unlikely to do it voluntarily. 2c Will prescription drug prices be curtailed in the next four years? Innovation continues, with both new technologies entering the fray and new models being tested. AI is slowly finding its place, while blockchain struggles as much in healthcare as in other segments. At the typical pace innovation matures in healthcare, blockchain may never matter, but there is great confidence that AI will get there with only 1% pessimism. 3a Has artificial intelligence made a difference in healthcare? 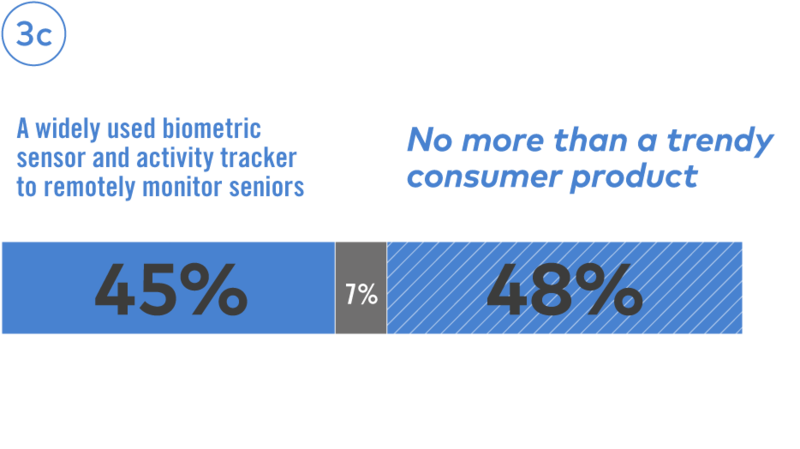 Our prescient group predicted the outcome of a Stanford study which enrolled over 400,000 Apple Watch wearers… it is not an effective AFib device. Yet, they were split on whether it’s just trendy or will have meaningful utilization for tracking seniors. It remains to be seen whether the study will change opinions on that topic. The Amazon/Berkshire Hathaway/JP Morgan healthcare partnership faces a sophomore slump of disillusionment, but keep in mind the usual learning curve sees a rebound in the junior year. 3e One year in, how confident are you in the Amazon/ Berkshire/Hathaway/JP Morgan healthcare partnership? Data privacy and diversity are two important issues facing the industry today. How are we doing? Regardless of how the market is performing, some credit should be given for a sector fostering an overall positive sentiment towards diversity. The industry is split down the middle on whether we will see a backlash for violating patient trust and privacy. Like Facebook, isn’t it just a matter of time? Will the following healthcare IT sub-sectors experience growth in the next 12 months? What will happen to the capital markets for private healthcare IT companies? How concerned are you about each of the following challenges to healthcare IT innovation in the next 12 months? One year in, how confident are you in the Amazon/Berkshire Hathaway/JP Morgan healthcare partnership? Has artificial intelligence made a difference in healthcare? What does the future hold for hospital consolidation? Will prescription drug prices be curtailed in the next four years? How will the results of the midterm elections impact the future of the US healthcare system? 28% Is it 2021 yet? Which of the following 2018 early stage (A & B) financings do you regret not having been in? Which of the following 2018 later stage (Series C on) financings do you regret not having been in? Which category best describes your employer?